Loha Prasat temple is also known as Wat Ratchanatdaram meaning ‘Temple of the Royal Niece’. Inspired by two similar temples from India and Sri Lanka, Loha Prasat is also known as the ‘Metal Castle’ which is made up of iron and steel also naming it as an iron castle or iron monastery. It is an Indian name dating back from the time of Buddha. It was constructed in the early 19th century and today is the only one of its kind because of its unique construction style. It is quite next to well known Wat Saket, but Loha Prasat is rarely talked about. But you would never regret exploring this wonderful place. 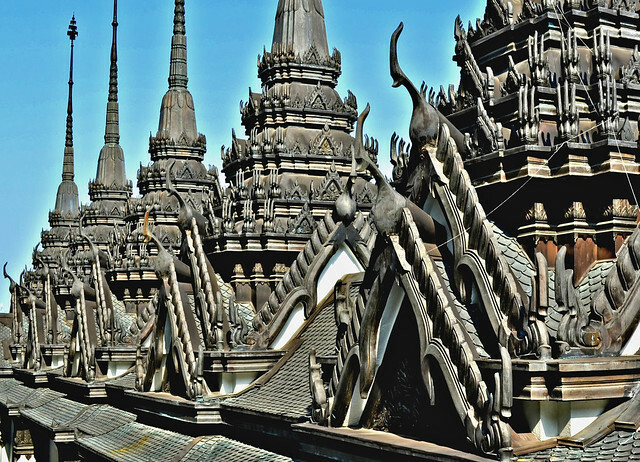 Loha Prasat is a multi-story structure composed of 5 towers designed on a square base made up of the metal spire. At the back of the temple is a popular amulet and Buddha statues market which is a must visit.